Just a side note from the usual energy fare locally. Last night I took a course home from work which would put me in prime viewing position of the Mighty Comet as the sun set in the SouthWest. Of course, naturally, after 3 days of clear and cold, the clouds had rolled in to obscure the view. Today, I see this at SpaceWeather.Com - The sucker is visible in broad daylight. Great. Thirty degrees and snowing in Seattle today. Marvelous. Comet is flying to Australia to get some surfing in, meanwhile. 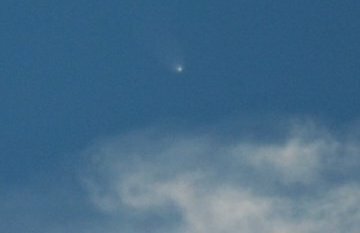 DAYTIME COMET: Comet McNaught is now visible in broad daylight. "It's fantastic," reports Wayne Winch of Bishop, California. "I put the sun behind a neighbor's house to block the glare and the comet popped right into view. You can even see the tail!" Your lucky, being upside down and all, you can catch it at sunset.